Arboviral infections have been identified as a main public health concern for the Lao PDR. 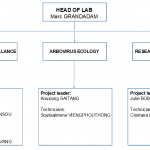 Developing an arbovirus surveillance system, initially focused on dengue, to benefit the Lao health authorities is a pillar activity for the Arbovirus and Emerging Viral Diseases laboratory. The emergence of chikungunya in 2012 and the recent extension of the Zika virus worldwide led to some adaptation of the surveillance network and working procedures to improve hospital support and feedback to health authorities. New strategies for data interpretation started to be developed to improve our understanding of dengue transmission in Vientiane Capital. Comparison of surveillance data evidenced for the second consecutive year a dramatic switch in dengue transmission peak occurring in October–November instead of August–September. Climatic conditions may explain this phenomenon as rainfall amplitude and occurrence diverged from the expected annual profile. Collection of multiple parameters linked to human behavior, mosquito populations, and the environment will help in building models for simulation and prevention and control assessment. Studies were performed to determine the kinetics of dengue viremia. It is commonly assumed that the duration of dengue virus viremia last only few days after fever onset. A follow up of more than 100 dengue confirmed cases revealed discrepant kinetics between plasma and white blood cells. Deeper analyses are now ongoing to determine the importance of dengue cellular viremia in the diagnostic algorithm of dengue virus infection. 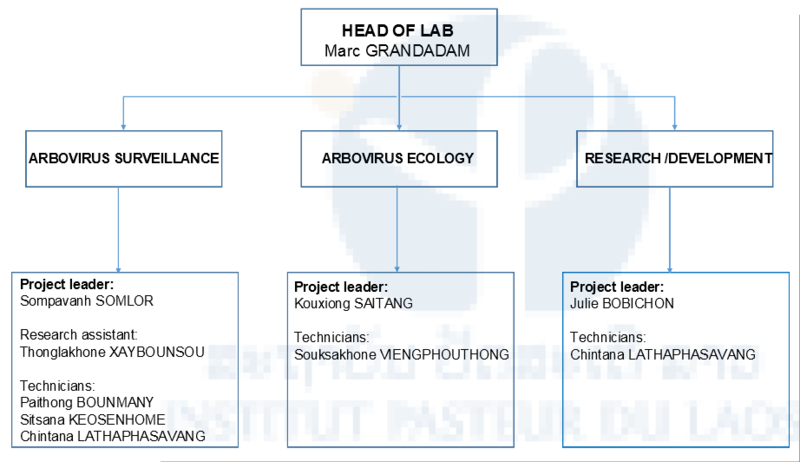 Arbovirus ecology, the second main work axis, focuses on determining the inventory of potential arthropods and pathogens that may be transmitted in different regions of Lao PDR. During the last two years, investigations of ticks and sandflies provided encouraging results and valuable biological material. Viral and bacterial species could be detected and /or isolated from arthropods, opening new fields of investigation and collaboration perspectives. Impact studies on the Lao human population are ongoing with a potential phlebovirus isolated from sandflies from the Lao PDR. Mosquitoes are known to play a major role in human health as proven by the dengue surveillance data. Culex are the main vector of Japanese encephalitis and can possibly serve as vector for other flaviviruses (i.e. West Nile) or Bunyaviridae (i.e. Tahyna virus). A specific study held this year focused on Culex collected in two Lao provinces enabled the detection of viral sequences belonging to flavivirus and alphavirus genera. Viral culture and full characterization tests are ongoing to identify viral species and determine their pathogenic properties. Development of in-house tests became a major activity for the laboratory. Low-cost and rapidly available tests are the keystone of the differential diagnosis strategy and for risk assessment in the Lao population. New tests are under development for identified emerging/re-emerging viruses (i.e. Zika, Tahyna, phlebovirus) or new potential threats associated with a high risk of epidemic in Southeast Asia (i.e.yellow fever). This research and development activity has also been a vector to extend the laboratory’s international collaboration network. 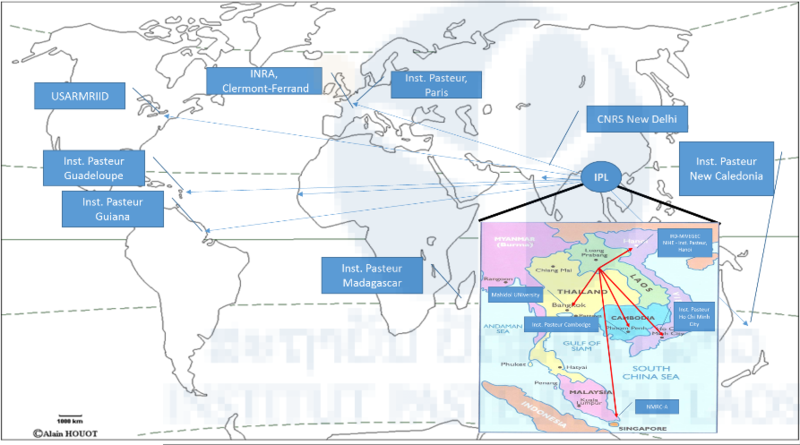 Prototype tests for chikungunya and Zika virus were evaluated through multicentric studies within the International Institut Pasteur network or other institutions. These tools are now used to assess human exposure to the different viruses suspected or proved to circulate near different groups of the Lao population.